MERSING, 7 July, 2010 – Universiti Kebangsaan Malaysia (UKM) is applying for a 300 acre site at Teluk Sari near here to be developed as a marine ecosystem research centre to enable it to carry out a more impactful research. Its Vice Chancellor, Prof Tan Sri Dato’ Dr Sharifah Hapsah Syed Hasan Shahabuddin said the centre when operational will help to bring about economic development to the area and be a catalyst to improve quality of life of the local population by providing business and job opportunities. 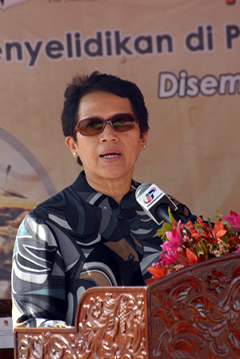 She was speaking at the ground breaking ceremony of UKM’s Marine Ecosystem Research Centre (EKOMAR) to be built on a three acre site at Tanjung Resang, Mukim Penyabong near here. 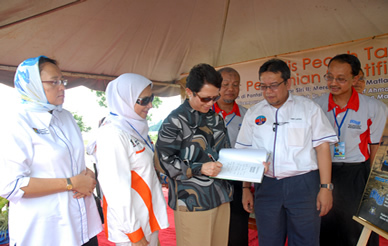 It was officiated by Deputy Minister of Defence, Datuk Dr Abdul Latiff Ahmad who is also the Member of Parliament of Mersing. The centre will be equipped with laboratories, office space and research workshops for locals as well as foreign scientists. It is rich in flora and fauna as well as marine life. It can also become a reference and research centre for students on subjects connected to marine ecosystem and will have other facilities including hostels for students and those from Mersing. Prof Sharifah Hapsah praised EKOMAR for its efforts in having the new centre since its formation in June 2007 which will give it a new dimension in research on the nation’s marine ecosystem. Scientific Expedition 2010 an extension of the Mersing Expedition 2008 which succeeded in producing Monograf 3: Research and Information on Malaysian Marine Life was also launched at the ceremony. The research findings were presented at the Johor Eastern Seaside Seminar held last year. The second expedition is a joint effort of 80 scientists from the Faculty of Science and Technology, Faculty of Social Sciences and Humanities, Faculty of Economy and Business, Faculty of Allied Health Sciences together with other scientists from Universiti Malaysia Sabah, Universiti Malaysia Terengganu and the Marine Department. The research is being carried out on an integrative concept basis involving multi, inter and transdisciplinary efforts incolving four main clusters from the Faculties of Pure and Applied Science, Social Sciences, Economics and Laws, Technology and Marine Engineering as well as Education, Health and Medicine faculties. The scientific expedition covering the east coast of Johor is divided into four main clusters consisting of. In line with phase one of EKOMAR strategy from 2008 to 2012, to collect and integrate resources and basics needs, the current research will be divided into three zones. Zone 1 covers Pulau Tioman, Pulau Seri Buat, Pulau Pemanggil, Pulau Besar, Pulau Tinggi, Pulau Sibu, Pulau Sibu Tengah, Tanjung Tenggaroh and the new EKOMAR centre in Tanjung Resang. Zone 2 consists of Kampung Sedili Besar, Teluk Mahkota, Kampung Sedili Kecil, Kampung Laut, Kangkar Sedili Kecil dan kawasan utara Kampung Tengah. With zone 3 covering the Southern Region of Kampung Tengah, Desaru, Kampung Punggai, Teluk Ramunia and Kampung Sungai Sengit. The research findings will be presented in Monograph series 4 for Ekomar. Deputy Vice Chancellor (Research Affairs and Innovation) Prof Dr Rahmah Mohamed, representatives from the District Office and scientists involved in the expedition were also present at the ceremony.